Unlike the Queen, I will not be delivering a video message. You will not want to be seeing my ugly mug that’s for sure! I do however want to thank all of my readers for their amazing support over the past year(s). I don’t get to blog as much as I would like. But it’s great that you keep coming back. Exciting times ahead for me and what I am trying to achieve. A couple of new adventures planned for next year, including a new delivery system for my Workshops. I wish all of you and your families a wonderful Christmas and a very happy and prosperous New Year. Jimmy was an inspirational man who many will know only as a presenter on Match of The Day. He was so much more than that. His playing career spanned over 350 games, the majority for Fulham, where he became Chairman of the Professional Footballers Association (PFA). He campaigned for the abolition of the then £20 maximum wage that a footballer could earn. He was successful in 1961. He came to us in 1961 at the age of just 33 and took over what then was a struggling 3rd Division club (League 2 now). Coventry in the 1960’s was an awesome place. After the City was destroyed by the Luftwaffe in November 1940, it was a time of redevelopment and transformation. A new Cathedral, a vibrant Motor Industry, we were turning out Iconic cars such as the E type Jaguar, Triumph TR4 and 5, The London “Black Cab” and the best Motorcycle ever made. The Triumph Bonneville. He harnessed this energy and transformed the club. Changing our kit to Sky Blue, adopting the nickname “The Sky Blues” and even wrote what became the club song to the tune of the old Eton Boating tune. “The Sky Blue Song” He also added visionary innovations such as pre match entertainment to encourage the fans to arrive early to build atmosphere. He created what was the first ever colour match day program. Arranged match day trains for the travelling fans to see away matches and oversaw the instillation of the games first electronic scoreboard. Something not so well known was Jimmy’s “pop and crisp” nights. He got the players in to give out pop and crisps to 100’s of young fans and sign autographs. The forerunner to the community programs that clubs all run nowadays. He oversaw a redevelopment of the ground which all helped City gain promotion from the old 3rd Division into the top division (Division 1) in 1967, He quit before the start of the clubs first season in the top flight. 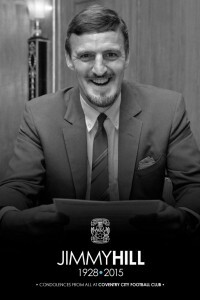 He became a Director of Coventry City in 1975, before taking over as Chairman. Making Highfield Road England’s first all seater stadium in 1981. Most will probably know Jimmy through his media work, his time on Match of The Day being the most notable. He was never afraid to be controversial and it was his idea to have a panel of pundits. Jimmy is also credited with persuading the FA to introduce 3 points for a win, which has been adopted all over the World. At a match between Liverpool and Arsenal in 1972 the linesman was injured. Jimmy stepped in to run the line. Incredible. In terms of important changes to the way Football is played, managed and viewed in modern times, Jimmy was the guy who forced and innovated those changes. 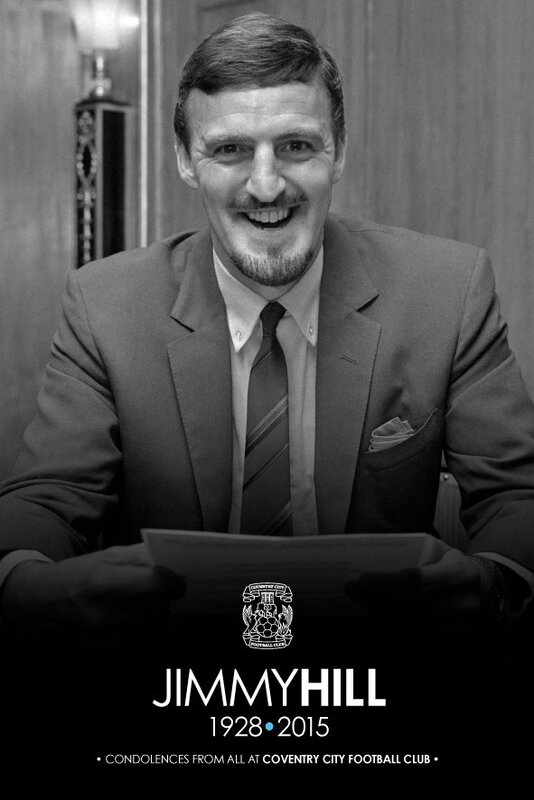 Jimmy Hill was the most important figure that the game has ever had. My deepest condolences go to Jimmy’s family. To the people of Coventry he will always be “Our Jimmy”. We will miss him terribly. He was and always will be a Legend. Over the time I have been writing my blog, you may know that I struggle to maintain it as often as i should . 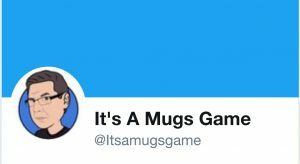 I have the Twitter account @itsamugsgame, but 142 characters is sometimes a waste of time. Sometimes i want to make a small comment, or see something that i want to reference. The blog is a little to “serious’ for that. So I have decided to make more use of Facebook. It seems that this might be the way to go for me. I will still be using the blog, and sometimes what I post on Facebook will be replicated on here and visa versa. i want to reach as many people as possible, I think that Facebook is much more mobile friendly, and as we all know mobile communication is the future (and present on doubt). So if you are interested in what i have to say (oh dear oh dear) Please Like my Facebook page and you will be able to hear a bit more from me. https://www.facebook.com/ItsAMugsGame/ is the place where I hang out. See you there! I just wanted to mention that I am going to be making a huge change to my Mentorship program in 2016. As it stands I have 2 remaining inductions into the program on 28th September and 23rd November. There are limited places left for these dates. MG World has been very successful in terms of what I set out to achieve. Once you have attended the induction you have the option to stay in “MG World” and have continued Mentoring. Many have taken up this option. In truth there has to be a limit to that support. The limit I am comfortable has been reached now. Moving forward in 2016 I will be offering a different product. This will be a day long workshop for Racing Traders. Access to my Skype rooms will not be included unless there are spaces available. Dates/Exact content and Pricing will be announced closer later in the year. I have 2 videos for you in this post that I pulled out from the last couple of weeks trading. This video is from the 4:25 Leicester on 10th April. It was a pretty volatile market and there was one time during the trade when it looked gruesome. I was just about to take a red when it shot back out again kept going. I am never afraid to take a loss if things are not going to plan. In this case I was confident to a point that I had it right. But as we all know there has to be a time when your belief impacts on common sense. This 2nd one needs no explanation, other than to say I didn’t make the best of it in hindsight. Hindsight is a beautiful thing! If you read my last post you will know I have been poorly. That hasn’t changed, but life has to go on. I was thinking about the blog and how I started it and what it turned into. I figured that something is better than nothing. What I aimed to do was give a detailed explanation of what my thinking was as I was in the trade. For the foreseeable future I am not going to do this. It is incredible time consuming. What I am going to do is go back to posting my videos. Minimal explanation, but you should be able to pick up what is going on with my narration in the video. Just so you know. Every video I make is unedited. I don’t over dub. I just say what I see. I make mistakes like everyone. In fact I can pull apart every single trade i have ever done and make improvements to it. What this will mean is many more videos, which I guess is what people like. Just to say the guys in my Mentorship Group had access to this video while the race was still running. This is a great aid to compare how they traded it compared to me. I am happy to answer your questions and welcome your comments. Here is a trade from yesterday. Where the F*** Are You Steve? I just wanted to very quickly let you know why no blog posts……. You know that over the years i blog spasmodically. There are periods when i am prolific, and other times where there are big gaps between posts. I know that if you read my material there is a body of work that many of you relate to. Blogging is time consuming and if I don’t have anything to say, then I tend not to post just to generate interest in myself and my “products”. Since Christmas I developed a nasty cough, you may hear it on the odd video. This hasn’t gone and I have became a bit poorly. I seem to be close to some effective treatment now so i am hoping to be on the mend very soon. I hope to be back writing and making some videos soon. I appreciate all my readers, especially the ones who take the time to message me. If you have and i haven’t replied to you. Please except my sincerest apologies. Old General Tufto is a regular on the All Weather tracks. This was his 150th(?) race. So the old bugger knows the game. This by the way has nothing to do with how I trade him. That is irrelevant. But if you are like me, sit and watch pretty much every race, every day. You cannot but get drawn into the drama and romance of Racing. Although back on the freezing cold late January afternoon at Southwell, there was nothing to dramatic or romantic! This was a competitive 1m Handicap. These runners race against each other week in week out and pretty much take it in turns to win. In the Generals last race he started favourite and was quite short considering the type of race. He downed tools and ran a stinker. I am concentrating on the first 3 in the market here to find a trade. But I am keeping a close eye for something to be backed in from the outsiders. You will notice when the video starts I am mid trade and have a nice little green book. I don’t really want to comment too much on this trade. Mainly because I can’t remember it! What is important to note is we are 10 minutes from the start of the race. It is very rare you see me involved this far out. But due to the bad weather only Southwell and Wetherby survived. The race times were altered to accommodate an even gap. When this happens (only 1 or 2 meetings) the money arrives in the market differently. The best way I can try to explain it is that a certain amount will be matched prior to the off. Lets say for arguments sake £900,000. (ok I cheated and looked) When the video starts there is almost £266k matched. That means that £635k will be matched in this 10 minute timeframe. There is no other race in play. If I break this down…..
What is interesting about these numbers is how consistent the increase in volumes are. Of course this increases right before the off. But the gradual and relatively smooth increase in volume is very different to when you have a busy day with only 3 minutes between when a race ends and the next starts. This is very much something that needs to be taken into account. There is no way I would dream of getting involved with this race this far out while another race was in play. The previous race had actually finished 4 minutes before the start of this video. I had seen an opportunity to make a few quid on Falcons Reign, that trade was coming to an end and I closed it for a profit of £15. If you look at the Last Priced matched “Candlesticks” to the left of the traded Volume Column, you will see that after moving in from 3.65 into as low as 3.25 the direction has now shifted. This may be temporary, (it was as it happens), but there was a change in opposition to this runner with pressure from different runners. I was happy to take a small profit here. There is plenty of time to go and a complete reassessment of the market was called for. So at 1:46 into the video I open a Lay Trade for £200 on General Tufto. My reasons were that this was the original favourite, there had been plenty of time for it to be supported if that was going to happen. There was opposition to it in the market. The trainers very negative comments on TV were just the trigger that may make it drift even more. The cross over point at 6 is looming and I have my eye on some enhanced profit once it reaches 6. I need to say again. We still have 7 minutes to go here. One of the things you will know I do is what I call “Progressive Staking”. I never go in with my full stake from the start. My aim is to “feel” my way into the market, then as my position improves I add to my stake, constantly reassessing my position. If it improves, I add more if I see the trend continuing. If I am worried things are starting to turn, then I take some out. In this case after my initial £200 which does not completely get matched at the 5.6 I requested. I leave the £61.56 in the queue and add to the trade with another £200 lay at 5.8 before moving the rest of the unmatched £61 to 5.8 too. My total stake is now £400 and my liability £1876.89 – (I have £15 green remember). I always have an exit plan. In this case my exit would be at 5.4 for a loss of £24.51 on GT and an overall negative position of around £9. But if you keep your eye on the overall position indicator (just to the right of the countdown clock) you will see at no point does it go into a red negative book position. As my position improves and goes towards 7 I decide that maybe I should ensure I walk away with a decent profit for my efforts here. The market is becoming a little static. I take back £100 by placing a back bet at 6.8 of £100. This is matched. The shortly afterwards another £150 at 7. I have only £150 of this trade left in the market now. I did say it was a long video!! There are still a couple of places left for the February 23rd Mentorship Induction. Please email at mugs game@hotmail.co.uk if you would like to reserve a place or have any questions.